Highway 20: From Williams Lake visitors may travel west for 455km (282 miles) through the Chilcotin Plateau, over the Coast Mountains and down the Bella Coola Hill to the Pacific Ocean. This scenic highway provides much to see and do along the way. Enjoy the abundant fishing, hiking, horseback riding and white water rafting here in this land of adventure. Turn south 45km (28 miles) beyond Williams Lake to visit this Wildlife area which protects over 500 California bighorn sheep. Farther down the road is Farwell Canyon where the Chilcotin River cuts deeply into the clay and limestone cliffs. Visit the pillar-like hoodoos, impressive sand dunes and Indian pictographs of this unique area. Guided rafting trips are available to experience the Chilcotin River rapids. Back on Hwy 20, travel west through many small communities such as Riske Creek, Hanceville (Lees Corner), Alexis Creek, Chilanko Forks, Nimpo Lake, and Anahim Lake. 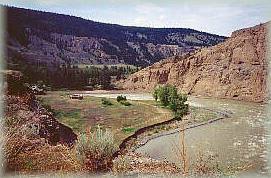 West of Alexis Creek, be sure to stop for a picnic or over night by the river at Bull Canyon Provincial Park. 36km (22 miles) west of Anahim or 352km (218 miles) west of Williams Lake is the entrance to B.C. 's largest Provincial Park. The majestic Tweedsmuir is a wilderness park and incorporates only 54km (33.5 miles) of highway within its boundaries. After descending down the famous 'hill' you will enter the Bella Coola Valley. 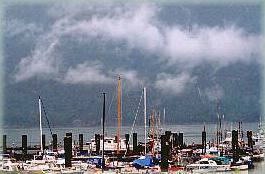 The village of Hagensborg was settled by Norwegians, who were attracted by the fjords. Hwy 20 ends here in Bella Coola at the head of North Bentinck Arm, an inlet of the Pacific Ocean. In 1793 Alexander Mackenzie came overland to this area, while Captain George Vancouver came by water.